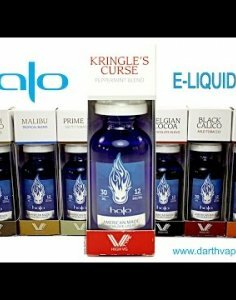 Kringle's Curse is a popular flavor included in the V-Type, a new high VG e-liquid line by Halo Cigs. It is also one of the Halo flavors that has received a Spinfuel Choice Award. It is a sweet, peppermint blend with a strong smell of fresh peppermint. The inhale is top notes of smooth peppermint with undertones of sweet candy. The throat hit is cool and minty and not overpowering like some mint flavors. The combination of flavors create a refreshing peppermint candy for the exhale. Kringle's Curse is one of my top favorites from Halo and I'm glad that they added it to the V-Type line of e-liquid.